The Mixologists & the Teamaker is a manifestation of Dilmah’s dedication to tea as a versatile and essential ingredient in modern mixology. Mixologists around the world are encouraged to interpret this traditional herb in a unique form in a soulful marriage of flavour, character and artistry. This March, 10 of the world best mixologists will converge on the shores of Sri Lanka, the enchanting land of tea, for the first ever “the Mixologists & the Teamaker”. 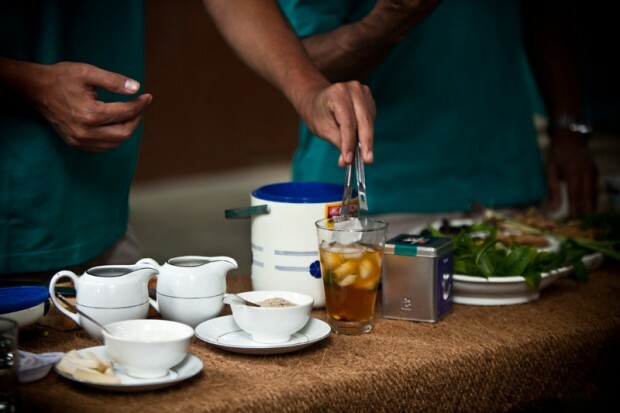 This one of a kind event takes place from the 17th – 27th March, 2013 where they, together with Dilmah founder Merrill J. Fernando – one of the most experienced and respected tea makers of the world, create liquid magic with tea at the heart of it. Designed to bring an entirely new dimension to tea, the 11 day event will see the participants experience the many facets of finest Ceylon tea. The participants will participate in the Dilmah School of Tea programme, travelling to Dilmah tea gardens across various climatic regions from Ratnapura to Nawalapitiya as well as the iconic Dimbula and Nuwara Eliya, famous for their unique tea. They will experience how terroir affects each tea, witness tea production and taste tea fresh off the factory. They will also get a flavour of the spirit of this beautiful island as they explore local spice gardens, spot elephants on safari, watch traditional potters at work at Mankada in Udawalawe and camp beneath starlit tropical skies at the Yala National Park. Additionally they will participate in various activities at the MJF Charitable Foundation Centre and take part in Dilmah Conservation projects to green the world. Follow the heady journey of 10 Mixologists and 1 Teamaker 17th – 27th March 2013. Subscribe to our RSS feed and visit us on site as well as on facebook.com/dilmah for updates and pictures.